I found this little aside in a notice about a memorial event for the 100th anniversary of Shir's birth, in 1890. Acting Chief Rabbi Hermann Adler was a musmach of Shir, which is why he chaired the event; he is mentioned giving some of the highlights from his rebbe's Erech Millin, and also the humorous - if you think it is - anecdote. In any case, the anecdote is about two students named Shmuel. 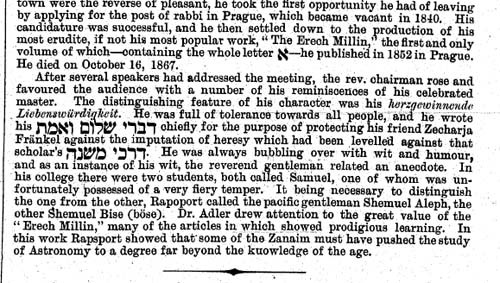 Rapoport called them Shmuel Aleph and Shmuel Bais, which is cute/ expected. But in this case it was also a pun, since one of them had a temper, and he was the one who got called "Bise" which was meant to pun on the German word böse, which means angry. Get a new name, sheesh!